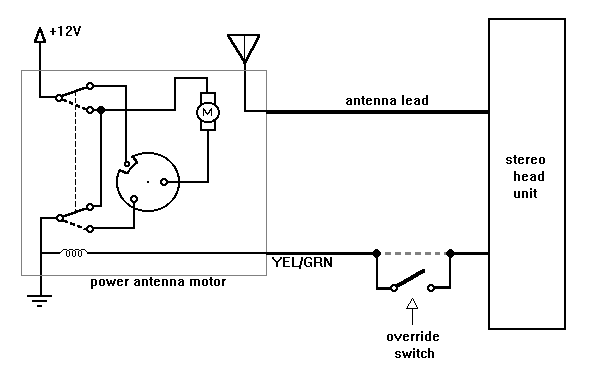 This override switch operates very simply: turn it off to force the antenna to the "down" position, and turn it on to allow the radio to control the antenna. With most radios, this means the antenna goes up whenever the unit is on, regardless of whether you are playing a cassette, CD, or using the AM/FM tuner. The switch interrupts the flow of current in the yellow/green wire that the radio uses to control the antenna. Turning the switch off breaks the connection between the radio and the antenna, forcing the antenna to stay down. Turning the switch on resumes normal operation, where the antenna goes up whenever the radio is on. Remove the ashtray assembly, the entire center console, and the radio. Mount an SPST on/off switch in the desired cut-out in the parking brake console. Attach two wires to it, and cut them long enough to run inside the center console next to the transmission shifter to the backside of the radio. Locate the wire coming from the connector at the back of the radio which is yellow with a green stripe. Cut this wire in two, leaving enough wire length on each end to work with. Strip the ends of all four wires. Use splice connectors to attach each of the antenna switch's wires to one of the ends of the yellow/green wire.